My wife and I will be going to Toronto in a few weeks to celebrate an anniversary - our first visit, looking forward to it. Will be there for a weekend, staying in Yorkville. Apparently one can make a reasonable walking circuit and hit Little Portugal, Little Italy, Cabbagetown, Chinatown East/West, India Bazaar and Greektown all in the same day. Any suggestions on places for memorable snacks during strategic rest stops on the walk? Any great local bars? Open to suggestions on the fine dining option too - my wife has ruled out Chiado, she's not a big seafood fan. Personally, I do not see how your are going to do all of those different neighborhoods in one day. Is it possible? Perhaps ... but why. If you are in Yorkville, I would head west on Bloor and then walk south Spadina. You will be walking through the edge of the University of Toronto. There are a few places along the way but nothing real memorable. In the blocks west of Spadina, you will start to see some retail and wholesale stores about 1/4 mile south of Bloor. Wander through the area and you will see a lot of great food shops. I believe that this is called the Kensington Market area. I probably been there a dozen times and have had everything from Chinese pastries to some Trinidad meat pies laced with Habernero peppers. Spadina itself is a collection of wholesae places and Asian retailers. 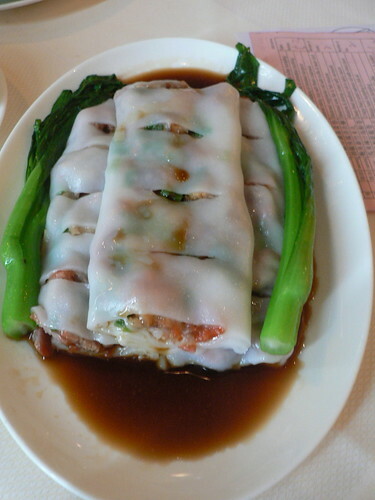 You will see a wide variety of Chinese restaurants that are more geared toward the Chinese communities. You will see a number of BBQ joints, a few bakeries and a plethora of vegetable stands. The Chinatown area around King and Queen St. has always struck me as a more touristy place. When you get to King Street, head East. You will see the stadium. 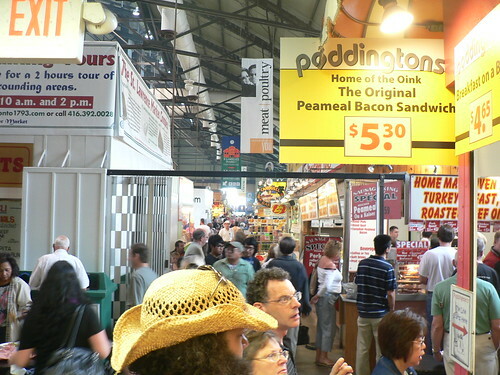 Stay on King until you get to St. Lawrence Market which is IMHO, one of the great reasons to go to Toronto. A lot of great fruit and vegetable vendors, artisan bakers and fresh butchers. It is the equivalent to the Windsor Public Market or Ottawa's Byward Market. It is also the busiest place in Toronto on a Saturday morning other than the suburban Tim Horton's outlets. I have to confess that I am not familiar with Cabbagetown although I have spent a lot of time in Toronto as I took a couple of courses in the '80s at St. Michaels. There are a lot of great Greektown restaurants off of the Pate TTC station and also some great Greek pastries. Do not try to drive Toronto. It is pretty much like driving in the Loop - limited parking at an exorbitant price. Plus if you are really interested in seeing the neighborhoods, you will find that in places like Greektown, finding a spot is next to impossible. When I go to Toronto, I generally stay of the U of T campus - Victoria, St. Michaels, etc. I park on campus for the daily fee and buy a TTC unlimited pass for the day or week. It is a lot simpler to figure out the TTC than the CTA. Also, unbelievably, the TTC employees are pleasant to deal with and don't mind helping tourists. I wish that I could give you more specifics but I haven't been to Toronto since I moved to Chicago in 2000. I will try to find a post I made a year ago to the Toronto chowhound board - we spent a long weekend (Labor Day) in Toronto and found some really great places. Probably the highlight was a Kosher Moroccan restaurant which was one of the best meals of our trip - and some of the best Moroccan food I have ever had (and it is one of my favorite cuisines so I have tried places all around the world). It was, however, fairly far afield, but not too difficult to reach by public transit (we didn't rent a car). We also had a great deal of luck working with concierages at smaller hotels - in particular I recommend the Warick Arms (sp?) which had a fantastic concierage who helped find us a reservation at last minute at a place we would not have otherwise found or gone to (which ended up being the main competition for the best meal of the trip - XXY I think was the name of that place). Toronto was a very fun city, definitely a place we want to return to in the future. jlawrence01 wrote: I do not see how your are going to do all of those different neighborhoods in one day. Is it possible? Perhaps ... but why. I dunno, I'm weird I guess but I like to walk. It only looks like 16 blocks east to west. I've yet to find a better way of getting a feel for a new city. Is Toronto like LA, pedestrian = felon on parole? Perhaps I should reconsider, I wanted to go to Montreal again anyway. And my sincere apologies if this is a redundant request. I didn't see any Toronto headers using this search engine and didn't realize that OH, PA, NY, ON is where one would find the definitive post on all things Toronto. Thanks for the link, my journey is complete. Shannon, thanks for the heads up on the Moroccan place. I don't get it. Sorry I didn't anticipate your trip to Toronto; if I had, I would have titled my post "Toronto: attn. Fast Eddie." Anyway, enjoy your trip. Toronto is a fine walking town. I'd point out that the Portuguese and Italian neighborhoods are one in the same. The main Chinese community is nearby. The distillery district, or whatever it's called, isn't really close to anything. Cabs are plentiful, and there's a subway, and electric light rail, too. Thank you Jeff, I like that header much better. I'll nuke you up some leftover poutine when I get back eh. You need to get a better map. The one that you are relying on only shows the MAJOR streets. Let me assure you that it is 10-12 blocks between University Ave and Yonge St.. And you are going further than that. Is it walkable? Sure. Terry Fox ran halfway across Canada twenty years ago. However, if you plan to check out all of the neighborhoods in ONE weekend, you better get a TTC pass. A day in Toronto / Mississauga yielded three chow opportunities. A Toronto suburb, Mississauga lays west of Toronto airport, spans a large area and is a municipality with 600,000 residents. Within Mississauga are modern office parks, some old port facilities and several strong ethnic communities. Check out the pictures at link above--note that there's not one skinny person. Not to disparage fitness, but I took this evidence of eating well as very positive. I rolled up to Mario's around 2:00 PM Monday afternoon. The front door to the dining room was locked tight, the inside lights off. I was devastated. Just then a women in a Mississauga Transit uniform pulled up. In fluent english seasoned with a thick Portuguese accent she steered me to the side door "Takeout only" she said. "You're at the right place, the food is terrific" she added. While I waited for my takeout order, six or seven people came in and left with trays and trays of food. This place seems no secret within the Portuguese community. Take the 401 (main east west Toronto xpway) west from town, exit Hurontario St, south to Dundas, turn left two blocks, Mario's is on the right, about ten minutes west of the airport. Nearby are many South Indian, Pakistani and Sri Lankan groceries and restaurants. Sigh. Did not try. 2. Toronto, in-town (I think) / north of downtown. 955 Eglinton Ave. W., 416-783-6494. I love this food, the culinary lexicon that spans Lebanon, Israel and Egypt. Its so easy to make yet rarely ever done right. This place is good or better across the board, including tahini rich hummes and very smoky baba ganoujh, very good falafel COOKED TO ORDER, nice assortment of pickles and olives, very good kabobs of lamb, chicken, and ground lamb. Most surprising of all was a lovely plate of sliced tomatoes sauteed with garlic, olive oil and a little basil--second cousin to a fresh marinara but served as an appetizer. 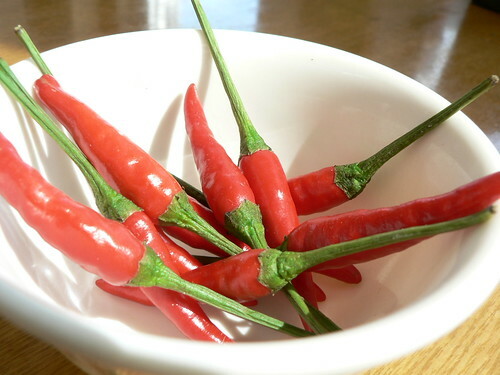 Worst: that damn Vietnamese hot sauce that's become so ubiquitous, rather than harissa. Sky Jack. On north side of Mississauga Rd just east of Mississauga Rd/Erin Mills Pkwy split. A small Greek coffee shop, Mississauga analogue to L&L Snack Shop on Northwest Hwy just beyond Des Plaines. Belly bacon that was 90% meat, peameal bacon--sort of like Canadian bacon but neither water pumped nor productized like what comes in supermarket cans, exc home fries (not hash browns), markedly fresh tasting eggs cooked perfectly in butter in a skillet, surprisingly good coffee. Thick white bread toast (ugh). Even takes credit cards. Khyber 7, Afghan in Brampton. I am off to Toronto for a quick trip and wanted to see if there are any recommendations. I searched and didn't come up with much. There's a world class chef in Toronto named Susser Lee. He had two places last time I was there. "Susser" served a backwards degustation (heavier to light) because he reasons you're hungrier @ the beginning of your meal than @ the end. He also serves different menus for all having it. I've only tested the theory with two people though. So if there are two in your party and it's 12 courses, they're both completely different and you get an amazing 24 items to share. The other is his more cafe like place called "Lee" which I found very good but not extraordinary. As I said, world class. Toronto is a great eating/walking town. Reminds me of Chicago both culturally and architecturally. Don't miss Queen St., Chinatown or Kensington Market. Jazzfood wrote: Toronto is a great eating/walking town. Reminds me of Chicago both culturally and architecturally. Don't miss Queen St., Chinatown or Kensington Market. From Queen St., head north on Spadina St. and walk north toward Bloor St, and you will hit most of Chinatown. They have some great Chinese bakeries along that route. There is another market area just west of Spadina that is grittier and a bit more interesting than Kensington (which also is a must-see). I have had some of the best Caribbean jerk and meat pies that I have ever had. I wish that I could give you names and specifics but it has been a few years. Unfortunately, back in the days when I had time to explore Toronto, my budget forced me to eat many of my meals at small lunch counters in drugstores around the University of Toronto. At that time, you could get a hot breakfast for under $1.50. Shop around for air fares. Generally, there have been some GREAT airfares MDW-BUF ($138 RT on Southwest) or ORD-YYZ ($208 RT on American) which have surfaced in the last week or two. Megabus services the route between the Buffalo airport and DT Toronto. Jazzfood wrote: There's a world class chef in Toronto named Susser Lee. He had two places last time I was there. "Susser" served a backwards degustation (heavier to light) because he reasons you're hungrier @ the beginning of your meal than @ the end. He also serves different menus for all having it. I've only tested the theory with two people though. So if there are two in your party and it's 12 courses, they're both completely different and you get an amazing 24 items to share. The other is his more cafe like place called "Lee" which I found very good but not extraordinary. As I said, world class. 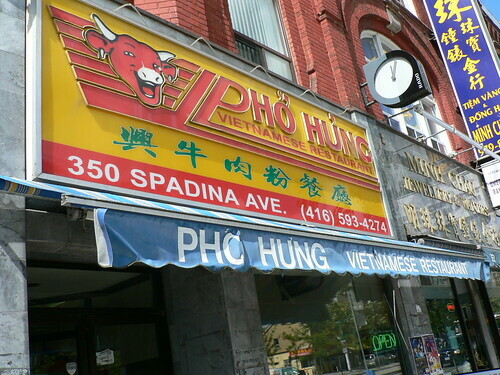 Since Susur packed his bags and moved to NY, I believe his high-end namesake restaurant is now shuttered in TO. Lee, however, remains open. I wouldn't recommend going out of your way to make it to Lee. If you want high end, definitely try Splendido. David Lee is probably one of the top chefs in town right now. 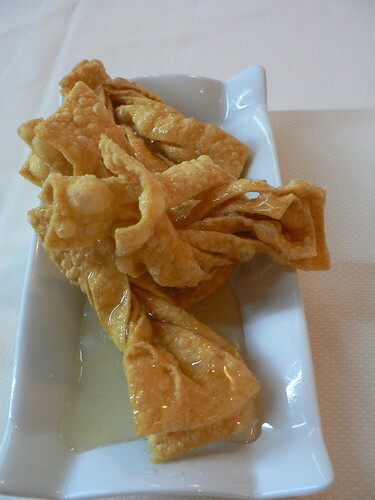 For really good dim sum, try Lai Toh Heen (just Google for the location). 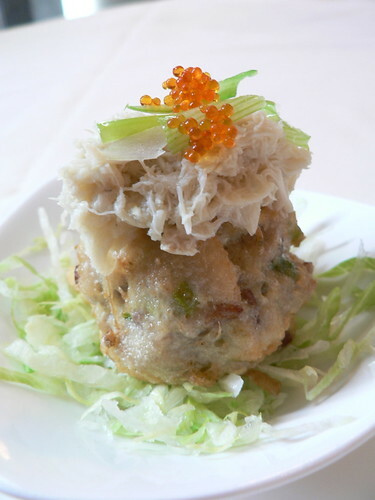 It's the newer sister restaurant to the famous Lai Wah Heen in downtown TO. Rol San in Chinatown is another decent dim sum place which is probably 1/4 the price of Lai Toh Heen, but the service there can be downright rude at times. I'd heard he was doing a NY place but didn't realize that meant he was done in Toronto. Now called Madeline's. Lee still apparently involved. There are so many good restaurants it would be hard to recommend one unless you can give more information about what you like and are looking for. Check out these two websites for some good info. The best Chinese food is actually in the suburbs north of Toronto in Richmond Hill - lots of Hong Kong influence and not what you might expect from Chinese food. Globe restaurant is also good. If anyone is in Toronto again - you might like to try The Foxley on east side of Ossington (near Dundas just north of Queen West) ... get there a few minutes before 6pm and you'll get a seat - anytime afterwards there's a line ... it is known for its ribs (refined asianfusion-ish food) ... there's a really worthwhile authentic pizzaria a few doors north too - closer to Dundas on the east street (quite noisy but somehow it fades into the background once you're seated - the pizza is amazing) - again lineups. Rhino on Queen West West is an unfancy 'neighbourhood' bar with a dining area at the back that serves basic organic steak & frites at a reasonable price ($22 for steak & frites w wine). This is my first posting - I'm grateful for finding this site ... am heading to Ft Myers to holiday with my folks tomorrow and got a great list of places in this area to eat at on the Ft Myers forum (have to laugh at everyone elses comments re so few & far between - we've been searching for places now for about 5 years). Also, Toronto has Portuguese food, which sadly is impossible to come by in Chicago. Superb food, great wines, reachable by trolley along College. Any ideas for dinner including Chinatown? Welcome. Lots of good posts here on Toronto. I'd begin with a simple search in Beyond Chicago. JeffB wrote: Welcome. Lots of good posts here on Toronto. I'd begin with a simple search in Beyond Chicago. Which would yield 2 Days of Chinese around Toronto for starters. I was in the Toronto area recently and had two good meals in the Mississauga area. This was a definitely hole in the wall with no seating at all, but great food and cheap. The star was the doubles which is mashed curry chick peas between two pieces of fried flatbread. It was spicy and delicious. Also the chicken roti was good. It's basically a burrito with curry filling and spongy flat bread instead of a tortilla as a wrapping. Definitely a good spot to hit for an on-the-go meal near the airport. Went here for Dim Sum Sunday morning and it was terrific. It's located in the Doubletree only a mile or so from the airport. The restaurant was serene and upscale, though reasonably priced for sure. The Dim Sum was extremely high quality and impressive. Some standouts included the fried lobster rolls and the cuttlefish mousse cakes, though everything was top notch. We were in a hurry to eat and head to the airport, and we couldn't have been happier with this place as a last meal before leaving Toronto option. Recently, RAB and I spent a lovely weekend in Toronto. The forecast called for nothing but rain - - but we were greeted with three days of sunshine and friendly smiles. Toronto, where neither of us had been for 20 years, is a wonderful walking town with some great food. At just an hour flight time, I highly recommend Toronto for a weekend trip. After dropping our luggage at the spacious, classy, centrally-located, ridiculously-reasonable-on-Orbitz Cosmopolitan Hotel, we walked to the nearby St. Lawrence Market area, where Buskerfest (a festival spotlighting street performers) was taking place just outside of the Market building. I'd read some good things about peameal bacon sandwiches and thus visited Poddington's to try their version. Peameal bacon is Canadian bacon with a cornmeal coating. The sandwich, topped with condiments better suited to a hot dog, was pretty bland and not something I'd seek out again. RAB, on the other hand, did better. He went and purchased two kinds of hot crispy bacon (loin, and belly) from a meat vendor and a fresh onion roll from a bakery. 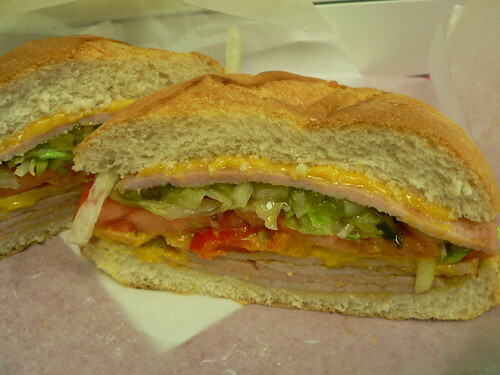 His sandwich, without the toppings, was about half the price of mine, and way, way better. 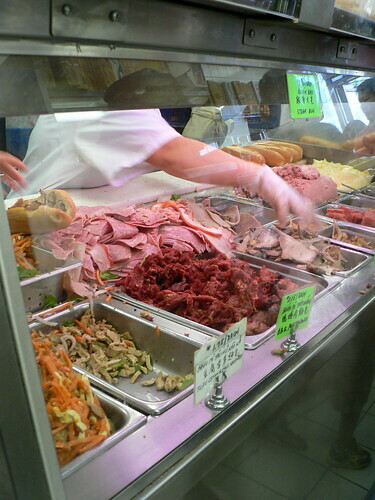 The St. Lawrence Market is a two-level food market with all the usual - - bakeries, meat, fruit, specialty shops, etc. It's similar to Philly's Reading Terminal Market, but perhaps not quite as wonderful. 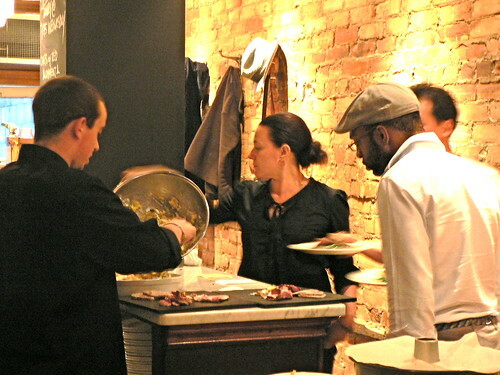 That night, we went to Union, a small, neighborhood restaurant focused on using the best of what's local. They've been open just a few months. We chose to sit at the bar overlooking the tiny kitchen where we got a preview of several dishes before we ordered. We were there at the beginning of dinner service, and the room quickly filled - - so it was exciting to watch the speedy dance as the small kitchen strove to churn out their well-executed fare. 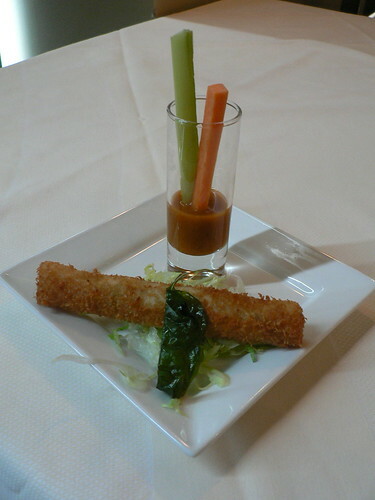 The menu is quite limited, with only a handful of appetizers and a few mains on offer. To start, we shared the rabbit terrine and the summer salad. The rabbit terrine was RAB's favorite bite of the weekend. It was light and airy, with a wonderfully herby rabbit flavor. The summer salad was simply dressed and featured tangy, local goat cheese, house-smoked bacon, and rosti (julienned fried potatoes). For mains, RAB ordered the steak hache, and I went with the sticky ribs. Both were good, but neither amazed. 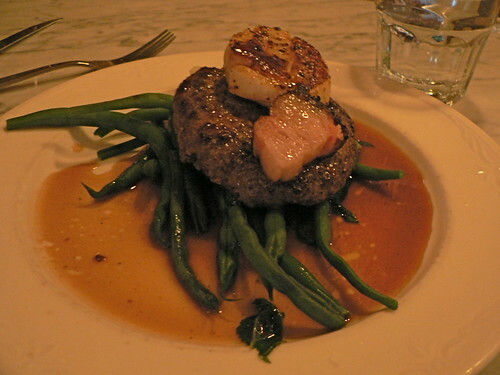 RAB's dish featured a hamburger over string beans topped with a scallop and pork belly. The highlight of the dish was the well-seasoned hamburger - - the toppings were unnecessary and made the dish too busy for our tastes. Though steak hache sounds nifty, it would have been better on a bun as a hamburger. 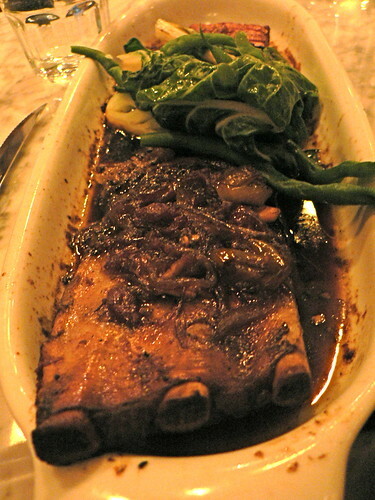 The ribs were braised in a tangy saucy, with just the right amount of sweetness. The dish included some crispy pork belly and nicely cooked vegetables. 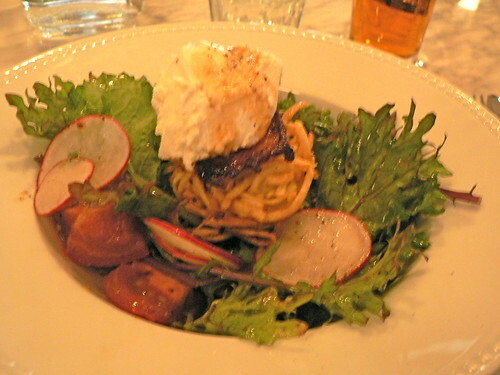 Each main comes with either fries or crushed potatoes with yogurt, radishes, and chives. We tried both, and both were outstanding. Because we'd gotten up at 5am to make our flight, we skipped desert and also skipped our visit to Swirl Wine Bar, a new kitchen-free restaurant featuring food in jars, such as pork rillettes. I was a bit sad that Swirl wasn't open during the rest of our short visit. I mention it, because it seems like the kind of place an LTHer might like to visit on a trip to Toronto. On our second day, we enjoyed dim sum at Lai Wah Heen in the Metropolitan, an upscale Chinese restaurant that others have posted about. Rather than select one of the fixed price menus, we ordered a la carte and had a wonderful meal, probably the best dim sum I've ever had. 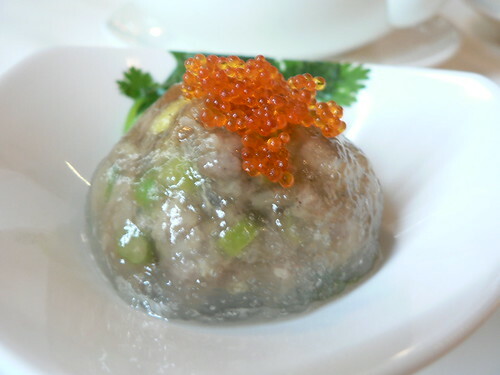 One of the dishes, "steamed crystal purse with five-spice shredded duckling and heart of garlic" is the best single bite of dim sum I've ever eaten. That night, we went to the Jamie Kennedy Wine Bar for a snack. They feature locally-focused small plates on an ever-changing menu. 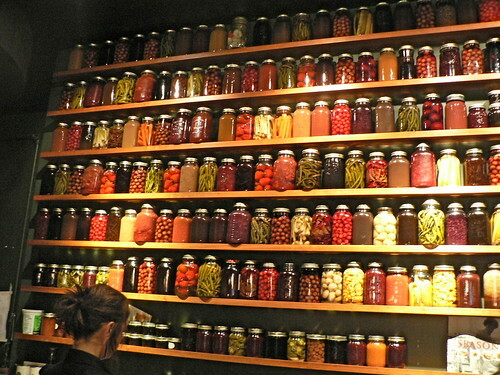 We sat at one of the bars, admiring a wall of jars. They claimed to use the jars "all the time," but we didn't buy it - - they were exposed to too much light and heat, being right above the stove and grill. In fact, when we got up close, we noticed some cobwebs on and between the jars. They really seem all for show. We didn't order much, but what we did order was good. Plus, it was nice to get to pair 3 ounce portions of wine with the dishes, rather than ordering full glasses that might not have gone with more than one dish. We especially enjoyed the local organic fries as a pork bolognese poutine. 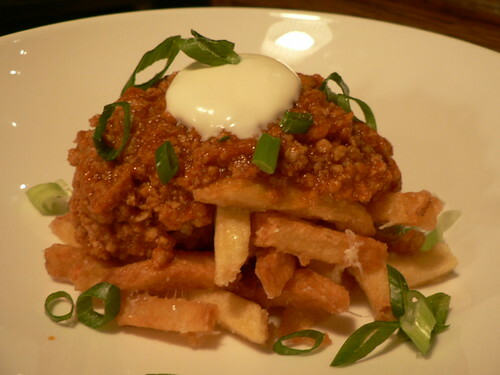 Great crispy hot fries with a sloppy joe-like topping. Yum. The charcuterie plate was well executed and featured a prune and walnut terrine, pork rillettes, and a chicken liver pate. 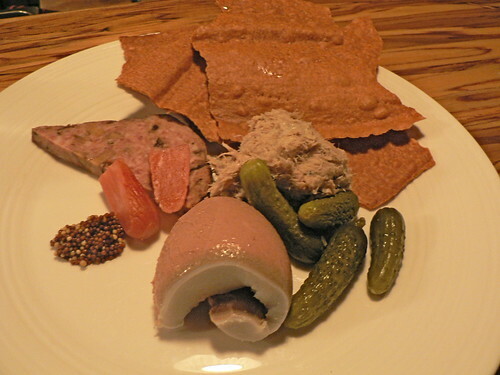 The pate and rillettes were wonderful, the terrine too pruney and nutty. 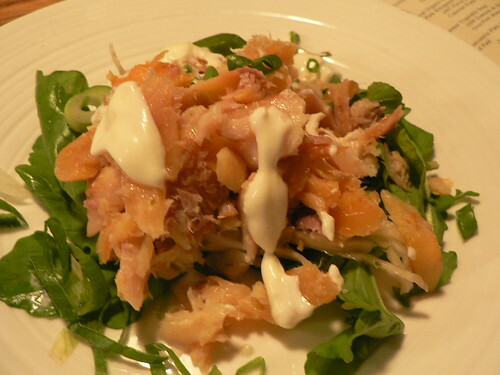 Finally, we enjoyed hot smoked lake trout with fennel and onion salad -- a great combo and a nice light dish. On our last day, we'd originally planned on a fancy lunch, but walking down Spadina St. the day before, we decided an Asian lunch crawl was in order. 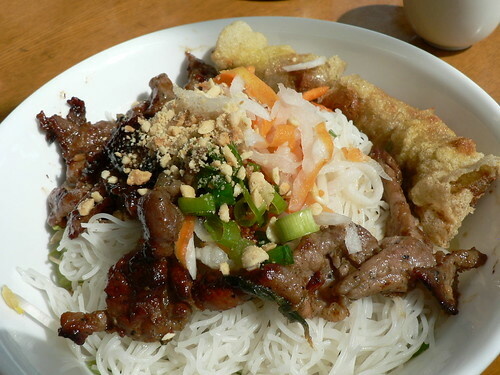 We started at Pho Hung, where RAB had pho and I had grilled pork and a spring roll over vermicelli. Have to say it, both were better than anything I've had in Chicago. Too many times, the pho broth is too punchy and unbalanced for me with clove and star anise in staring roles. 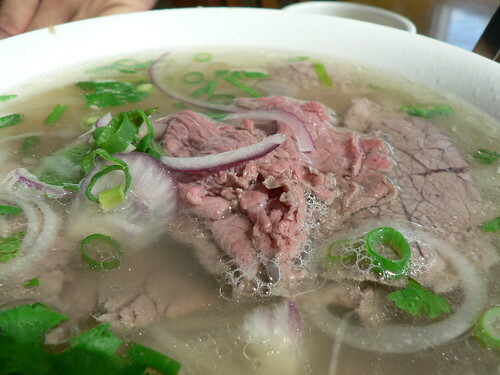 At Pho Hung, the broth was flavorful and well-rounded, with many subtle notes coming together nicely. The beef, too, was delicious and tender. 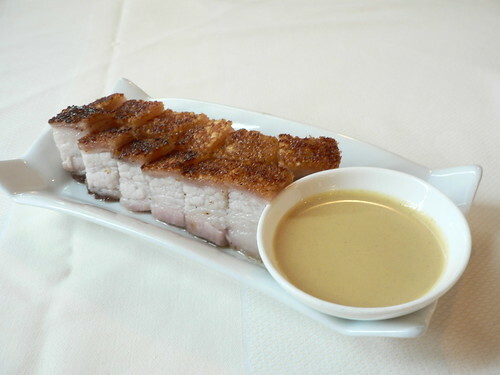 My pork dish was also great, with the hot, crispy spring roll and wonderfully-charred pork. I ate it all, despite the fact that we'd planned on this being only round one of an ambitious multi-restaurant lunch. 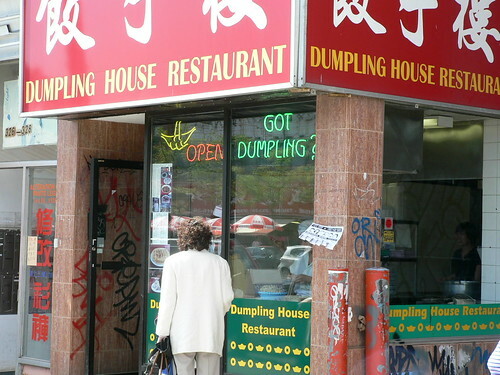 Next, we went to the Dumpling House Restaurant. 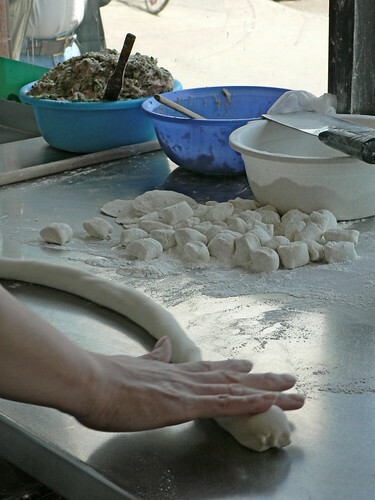 Dumplings are made by hand in the window. 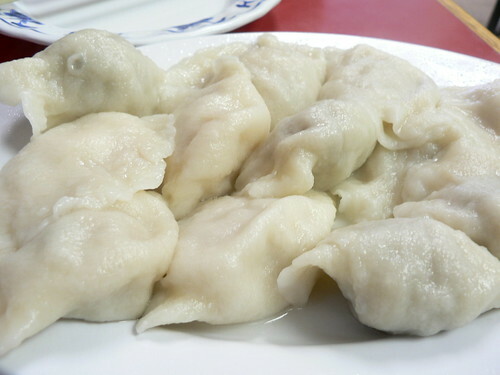 $6 for 12 dumplings - - you choose three kinds. We tried pork with sour cabbage, lamb, shrimp with pork. We went with steamed, rather than fried - - but steamed turned out to be boiled. They were still very good, served with a very interesting, crunchy, sambal-like hot sauce. We ate every one of the dumplings, but agreed that the pork with sour cabbage were the best. 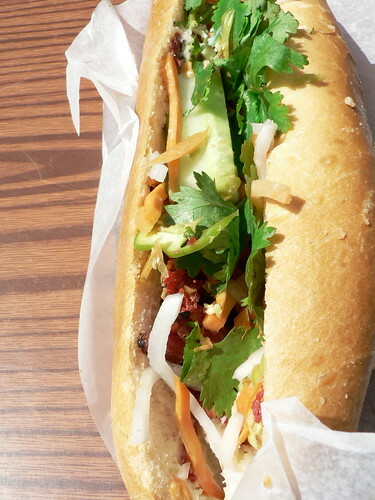 Finally, we stopped at Banh Mi Nguyen Huong for a pork banh mi. Despite the huge bar of ingredients and massive crowds, I didn't love the banh mi. I was full enough to give it a pass. I would go elsewhere for banh mi next time. There are three places I wanted to mention where we didn't take photos. We tried coffee and pastries at Petit Thuet, a downtown French cafe. What we had was wonderful, especially the drip coffee, and everything looked amazing - - pastries, prepared food, charcuterie. We also walked over to the Mill St. Brewing Company, which is located in the Distillery District, a very cool, old, repurposed distillery complex filled with Victorian industrial architecture, restaurants, and art galleries. Mill St. serves an excellent, very hoppy pilsner. And, finally, right before heading to the airport, we had a drink (or two) at Beerbistro, a downtown bar/restaurant featuring local microbrews and stellar service. REB wrote: Recently, RAB and I spent a lovely weekend in Toronto. Terrific post, makes me want to revisit Toronto pronto. G Wiv wrote: Terrific post, makes me want to revisit Toronto pronto. REB'n'RAB - nice post. I'm particularly happy that you were able to spend some time in Chinatown, which I find doesn't get mentioned as much as it should (along with outer burbs like Mississauga, Scarborough, etc). I have fallen out of touch with Chinese in Toronto (my home-turf) but have plans to rectify that over the course of the next several months. Thanks for sharing your trip. Amazing Chinese and Vietnamese food....and there is nothing like Kensington Market in Chicago...reminds me of Camden Town in London...what a trip.. I am looking for a great meal to be had in Toronto next week, any advice?